This entry was posted in digital home, VOIP by dstrom. Bookmark the permalink. b) Gizmo5 – Google just bought them so they aren’t currently accepting new signups. But watch this space! c) My pre-paid mobile number – for when I’m away from home. My GV number rings both the home phone and my mobile simultaneously. When I answer on the wrong phone, I can hit “*” to transfer back to the other phones. I can dial out using the GV website for free, or I can pay Gizmo $0.02 per min (but free for 800 numbers) for all domestic calls. Total cost = 0 if I avoid using my cell phone. Mac clients: Try Gizmo5’s client or Google’s Telephone client. Both work very well, simple UI and have nice features. If you want FANCY, then try X-Lite from Counterpath. 1. We use a device called ooma at the office which has unlimited lifetime voip once you buy the appliance. Connect to router and you’re done. 2. I use iskoot application on my blackberry as a way to sometimes make and receive skype calls when overseas. Works reasonably well and cost is low since it only adds 20 per month to my verizion plan when away for unlimited data (and can switch this on-off or prorate plan). 3. I also buy local sim cards for my ghetto nokia travel phone and then use onesuite.com calling card (which I love) to have people call me. Low rates and nice features like pin-skipping from select phone numbers and 2 digit rapid dial phonebook. Have tried a few usb solutions but they were all unreliable. 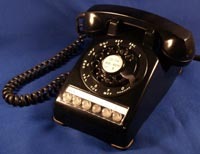 You should check out the retro handsets at thinkgeek.com – one bluetooth, one wired – to make your desk set complete. I abandoned my land line two years ago and use skype, primarily, as my smartphone. It has much better quality than my cell phone, usually. Also a Gizmo/Google Voice customer, but have not use their services much (except for GV as my primary cell phone voicemail, which is wonderful). Yeah, I love the thinkgeek products. That BT handset is a gas! Thanks for reminding me. I found a free VOIP application a few weeks ago. It is called “SSuite Office – VOIP Caller Extreme”. It does not use any third party website to connect to. It is a simple P2P softphone. It is also very easy to use.